Learn how to make Masala baby potatoes in airfryer. 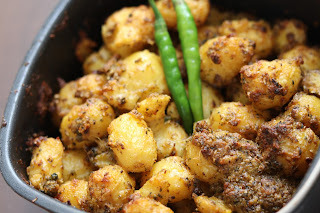 Simple airfryer recipe where potatoes are baked to bring out the flavour. These are delicious potatoes which can even be served as a side dish for lunch or dinner. 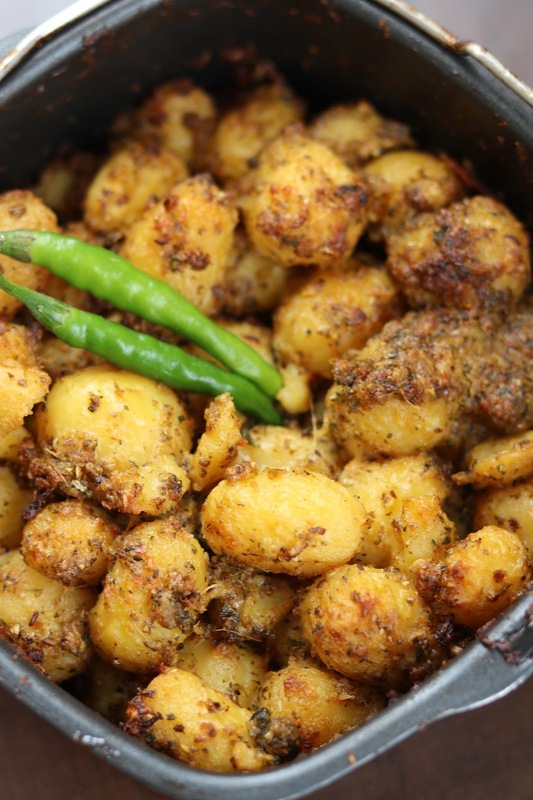 Flavourful masala coated potatoes are sure to satiate your taste buds. 1. Heat a non-stick pan and dry roast cumin seeds, coriander seed, dried red chili, garlic, ginger for 2-3 min on medium flame. 2. Remove from heat and cool down and grind these in mixer grinder to form a paste. 3. Add this masala paste in the boiled potatoes. Add rest of the ingredients except cream and mix everything well so that all the masala coat the potatoes nicely. 4. Transfer the masala potatoes in a baking dish and place it in preheated airfryer. Air fry at 180 degrees for 3 min for the first time. After 3 min, add cream and mix it well. Again put back in airfryer and bake at 180 degrees for 15 mins. 5. Once the potatoes are crisp and gets nice golden crust, then serve immediately.